Jessica Lee is examining the impacts of ongoing water restoration efforts in the Everglades. 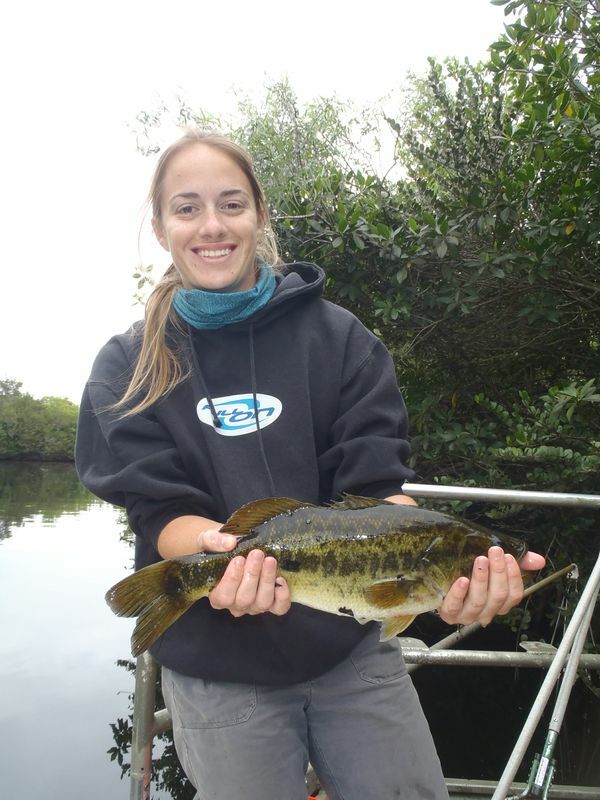 A graduate student in the Department of Earth and Environment, she has created the Coastal Angler Science Team (CAST), which combines tag and release methods as well as help from local citizens to evaluate the habitat of largemouth bass and snook in the Shark River Estuary. Environmental studies graduate student Jessica Lee tags and releases a largemouth bass in the Everglades. To mark the fish, passive integrated transponder (PIT) tags, or microchips with a unique code, are inserted in the belly of a fish. Lee and her thesis advisor, Jennifer Schopf Rehage, inject the tag through a shallow injection made by a syringe. The minimally invasive procedure lasts no more than 60 seconds on each fish. After the fish are tagged, weighed and measured, they are released back in to their natural habitat. Each PIT tag, measuring 32 mm, remains dormant until the fish are recaptured and it is activated by an electronic reader that is passed over it. This reader activates the tag and reads the unique identification number assigned to it. The FIU researchers are working alongside local anglers, recreational fisherman and fishing guides to collect the recapture data. The recapture of marked fish provides data on growth rates, movement patterns, survival and population dynamics. So far, Lee and Rehage have tagged more than 2,500 fish, including some from a pilot project from 2011. Their goal is to tag an additional 2,000 fish by the end of the year. Lee’s research project, funded by the Everglades Foundation, is set to run until 2014. “We hope CAST will become a long-term initiative where we can continue to work with the community in finding answers to make better management and conservation decisions and preserving fishing quality,” Lee said. Overfishing is the problem. There should be a strict fishing season.